For the cuisine of indigenous people of the Americas, see Native American cuisine. Indian cuisine consists of a wide variety of regional and traditional cuisines native to the Indian subcontinent. Given the range of diversity in soil type, climate, culture, ethnic groups, and occupations, these cuisines vary substantially from each other and use locally available spices, herbs, vegetables, and fruits. Indian food is also heavily influenced by religion, in particular Hindu, cultural choices and traditions. The cuisine is also influenced by centuries of Islamic rule, particularly the Mughal rule. Samosas and pilafs can be regarded as examples. Historical events such as foreign invasions, trade relations, and colonialism have played a role in introducing certain foods to this country. For instance, potato, a staple of the diet in some regions of India, was brought to India by the Portuguese, who also introduced chillies and breadfruit. Indian cuisine has shaped the history of international relations; the spice trade between India and Europe was the primary catalyst for Europe's Age of Discovery. Spices were bought from India and traded around Europe and Asia. Indian cuisine has influenced other cuisines across the world, especially those from Europe, the Middle East, North Africa, sub-Saharan Africa, Southeast Asia, the British Isles, Fiji, and the Caribbean. Indian cuisine reflects an 8,000-year history of various groups and cultures interacting with the Indian subcontinent, leading to diversity of flavours and regional cuisines found in modern-day India. Later, trade with British and Portuguese influence added to the already diverse Indian cuisine. Early diet in India mainly consisted of legumes, vegetables, fruits, grains, dairy products, and honey. Staple foods eaten today include a variety of lentils (dal), whole-wheat flour (aṭṭa), rice, and pearl millet (bājra), which has been cultivated in the Indian subcontinent since 6200 BCE. Over time, segments of the population embraced vegetarianism during the Śramaṇa movement while an equitable climate permitted a variety of fruits, vegetables, and grains to be grown throughout the year. A food classification system that categorised any item as saatvic, raajsic, or taamsic developed in Yoga tradition. The Bhagavad Gita proscribes certain dietary practices (chapter 17, verses 8–10). Consumption of beef is taboo, due to cows being considered sacred in Hinduism. Beef is generally not eaten by Hindus in India except for Kerala, parts of southern Tamil Nadu and the north east. While many Ancient Indian recipes have been lost one can look at ancient texts to see what was eaten in Ancient and pre historic India. During the Middle Ages, several Indian dynasties were predominant, including the Gupta dynasty. Travel to India during this time introduced new cooking methods and products to the region, including tea. India was later invaded by tribes from Central Asian cultures, which led to the emergence of Mughlai cuisine, a mix of Indian and Central Asian cuisine. Hallmarks include seasonings such as saffron. A page from the Nimmatnama-i-Nasiruddin-Shahi, book of delicacies and recipes. It documents the fine art of making kheer. Medieval Indian Manuscript Nimmatnama-i-Nasiruddin-Shahi (circa 16th century) showing samosas being served. Staple foods of Indian cuisine include pearl millet (bājra), rice, whole-wheat flour (aṭṭa), and a variety of lentils, such as masoor (most often red lentils), tuer (pigeon peas), urad (black gram), and moong (mung beans). Lentils may be used whole, dehusked—for example, dhuli moong or dhuli urad—or split. Split lentils, or dal, are used extensively. Some pulses, such as channa or cholae (chickpeas), rajma (kidney beans), and lobiya (black-eyed peas) are very common, especially in the northern regions. Channa and moong are also processed into flour (besan). Many Indian dishes are cooked in vegetable oil, but peanut oil is popular in northern and western India, mustard oil in eastern India, and coconut oil along the western coast, especially in Kerala and parts of southern Tamil Nadu. Gingelly (sesame) oil is common in the south since it imparts a fragrant, nutty aroma. In recent decades, sunflower, safflower, cottonseed, and soybean oils have become popular across India. Hydrogenated vegetable oil, known as Vanaspati ghee, is another popular cooking medium. Butter-based ghee, or deshi ghee, is used frequently, though less than in the past. Many types of meat are used for Indian cooking, but chicken and mutton tend to be the most commonly consumed meats. Fish and beef consumption are prevalent in some parts of India, but they are not widely consumed except for coastal areas, as well as the north east. Lentils are a staple ingredient in Indian cuisine. The most important and frequently used spices and flavourings in Indian cuisine are whole or powdered chilli pepper (mirch, introduced by the Portuguese from Mexico in the 16th century), black mustard seed (sarso), cardamom (elaichi), cumin (jeera), turmeric (haldi), asafoetida (hing), ginger (adrak), coriander (dhania), and garlic (lasoon). One popular spice mix is garam masala, a powder that typically includes seven dried spices in a particular ratio, including black cardamom, cinnamon (dalchini), clove (laung), cumin (jeera), black peppercorns, coriander seeds and anise star. Each culinary region has a distinctive garam masala blend—individual chefs may also have their own. Goda masala is a comparable, though sweet, spice mix popular in Maharashtra. Some leaves commonly used for flavouring include bay leaves (tejpat), coriander leaves, fenugreek leaves, and mint leaves. The use of curry leaves and roots for flavouring is typical of Gujarati and South Indian cuisine. Sweet dishes are often seasoned with cardamom, saffron, nutmeg, and rose petal essences. Seafood plays a major role in the cuisine of the Andaman and Nicobar Islands. Staples of the diet of the Indigenous Andamanese traditionally included roots, honey, fruits, meat, and fish, which were obtained by hunting and gathering. Some insects were also eaten as delicacies. Immigration from mainland of India, however, has resulted in variations in the cuisine. The cuisine of Andhra Pradesh belongs to the two Telugu-speaking regions of Rayalaseema and Coastal Andhra and is part of Telugu cuisine. The food of Andhra Pradesh is known for its heavy use of spices, and the use of tamarind. Seafood is common in the coastal region of the state. Rice is the staple food (as is with all South Indian states) eaten with lentil preparations such as pappu (lentils) and pulusu (stew) and spicy vegetables or curries. In Andhra, leafy greens or vegetables such as bottle-gourd and eggplant are usually added to dal. Pickles are an essential part of the local cuisine; popular among those are mango-based pickles such as avakaya and maagaya, gongura (a pickle made from Kenaf leaves), usirikaya (gooseberry or amla), nimmakaya (lime), and tomato pickle. Dahi (yogurt) is a common addition to meals, as a way of tempering spiciness. Breakfast items include dosa, pesarattu (mung bean dosa), vada, and idli. The staple food of Arunachal Pradesh is rice, along with fish, meat, and leaf vegetables. Many varieties of rice are used. Lettuce is the most common vegetable, usually prepared by boiling with ginger, coriander, and green chillies. Boiled rice cakes wrapped in leaves are a popular snack. 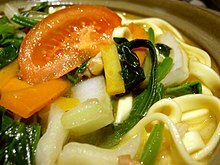 Thukpa is a kind of noodle soup common among the Monpa tribe of the region. Native tribes of Arunachal are meat eaters and use fish, eggs, beef, chicken, pork, and mutton to make their dishes. Apong or rice beer made from fermented rice or millet is a popular beverage in Arunachal Pradesh and is consumed as a refreshing drink. 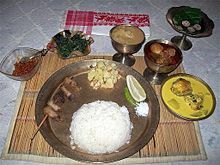 Assamese cuisine is a mixture of different indigenous styles, with considerable regional variation and some external influences. Although it is known for its limited use of spices, Assamese cuisine has strong flavours from its use of endemic herbs, fruits, and vegetables served fresh, dried, or fermented. Rice is the staple food item and a huge variety of endemic rice varieties, including several varieties of sticky rice are a part of the cuisine in Assam. Fish, generally freshwater varieties, are widely eaten. Other nonvegetarian items include chicken, duck, squab, snails, silkworms, insects, goat, pork, venison, turtle, monitor lizard, etc. The region's cuisine involves simple cooking processes, mostly barbecuing, steaming, or boiling. Bhuna, the gentle frying of spices before the addition of the main ingredients, generally common in Indian cooking, is absent in the cuisine of Assam. A traditional meal in Assam begins with a khar, a class of dishes named after the main ingredient and ends with a tenga, a sour dish. Homebrewed rice beer or rice wine is served before a meal. The food is usually served in bell metal utensils. Paan, the practice of chewing betel nut, generally concludes a meal. Bihari cuisine may include litti chokha, a baked salted wheat-flour cake filled with sattu (baked chickpea flour) and some special spices, which is served with baigan bharta, made of roasted eggplant (brinjal) and tomatoes. Among meat dishes, meat saalan is a popular dish made of mutton or goat curry with cubed potatoes in garam masala. Dalpuri is another popular dish in Bihar. It is salted wheat-flour bread, filled with boiled, crushed, and fried gram pulses. Malpua is a popular sweet dish of Bihar, prepared by a mixture of maida, milk, bananas, cashew nuts, peanuts, raisins, sugar, water, and green cardamom. Another notable sweet dish of Bihar is balushahi, which is prepared by a specially treated combination of maida and sugar along with ghee, and the other worldwide famous sweet, khaja, also very popular, is made from flour, vegetable fat, and sugar, which is mainly used in weddings and other occasions. Silav near Nalanda is famous for its production. During the festival of Chhath, thekua, a sweet dish made of ghee, jaggery, and whole-meal flour, flavoured with aniseed, is made. Chandigarh, the capital of Punjab and Haryana is a city of 20th century origin with a cosmopolitan food culture mainly involving North Indian cuisine. 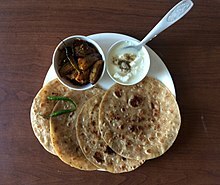 People enjoy home-made recipes such as parantha, especially at breakfast, and other Punjabi foods like roti which is made from wheat, corn, or other glutenous flour with cooked vegetables or beans. 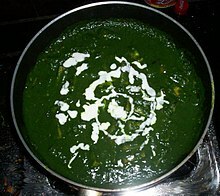 Sarson da saag and dal makhani are well-known dishes among others. Popular snacks include gol gappa (known as panipuri in other places). It consists of a round, hollow puri, fried crisp and filled with a mixture of flavoured water, boiled and cubed potatoes, bengal gram beans, etc. Chhattisgarh cuisine is unique in nature and not found in the rest of India, although the staple food is rice, like in much of the country. Many Chhattisgarhi people drink liquor brewed from the mahuwa flower palm wine (tadi in rural areas). The tribal people of the Bastar region of Chhattisgarh eat ancestral dishes such as mushrooms, bamboo pickle, bamboo vegetables, etc. The local cuisine resembles the cuisine of Gujarat. Ubadiyu is a local delicacy made of vegetables and beans with herbs. The common foods include rice, roti, vegetables, river fish, and crab. People also enjoy buttermilk and chutney made of different fruits and herbs. Daman and Diu is a union territory of India which, like Goa, was a former colonial possession of Portugal. Consequently, both native Gujarati food and traditional Portuguese food are common. Being a coastal region, the communities are mainly dependent on seafood. Normally, rotli and tea are taken for breakfast, rotla and saak for lunch, and chokha along with saak and curry are taken for dinner. Some of the dishes prepared on festive occasions include puri, lapsee, potaya, dudh-plag, and dhakanu. While alcohol is prohibited in the neighbouring state of Gujarat, drinking is common in Daman and Diu. Better known as the “pub” of Gujarat. All popular brands of alcohol are readily available. Delhi was once the capital of the Mughal empire, and it became the birthplace of Mughlai cuisine. Delhi is noted for its street food. The Paranthewali Gali in Chandani Chowk is just one of the culinary landmarks for stuffed flatbread (paranthas). Delhi has people from different parts of India, thus the city has different types of food traditions; its cuisine is influenced by the various cultures. Punjabi cuisine is common, due to the dominance of Punjabi communities. Delhi cuisine is actually an amalgam of different Indian cuisines modified in unique ways. This is apparent in the different types of street food available. Kababs, kachauri, chaat, Indian sweets, Indian ice cream (commonly called kulfi), and even western food items like sandwiches and patties, are prepared in a style unique to Delhi and are quite popular. 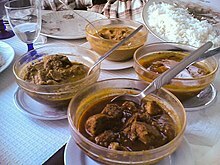 Pork vindaloo (pictured) is a popular curry dish in Goa and around the world. The area has a tropical climate, which means the spices and flavours are intense. Use of kokum is a distinct feature of the region's cuisine. Goan cuisine is mostly seafood and meat-based; the staple foods are rice and fish. Kingfish (vison or visvan) is the most common delicacy, and others include pomfret, shark, tuna, and mackerel; these are often served with coconut milk. Shellfish, including crabs, prawns, tiger prawns, lobster, squid, and mussels, are commonly eaten. The cuisine of Goa is influenced by its Hindu origins, 400 years of Portuguese colonialism, and modern techniques. Bread, introduced by the Portuguese, is very popular, and is an important part of goan breakfast. Frequent tourism in the area gives Goan food an international aspect. Vegetarianism is equally popular. Khaman is a popular Gujarati snack. Vegetable Handva is a savory Gujarati dinner dish. Gujarati cuisine is primarily vegetarian. The typical Gujarati thali consists of roti (rotlii in Gujarati), daal or kadhi, rice, sabzi/shaak, papad and chaas (buttermilk). The sabzi is a dish of different combinations of vegetables and spices which may be stir fried, spicy or sweet. Gujarati cuisine can vary widely in flavour and heat based on personal and regional tastes. North Gujarat, Kathiawad, Kachchh, and South Gujarat are the four major regions of Gujarati cuisine. Many Gujarati dishes are simultaneously sweet, salty (like vegetable Handvo), and spicy. In mango season, keri no ras (fresh mango pulp) is often an integral part of the meal. Spices also vary seasonally. For example, garam masala is used much less in summer. Few of Gujarati Snacks like Sev Khamani, Khakhra, Dal Vada, Methi na Bhajiya, Khaman, Bhakharwadi etc. Regular fasting, with diets limited to milk, dried fruit, and nuts, is a common practice. Cattle being common in Haryana, dairy products are a common component of its cuisine. Specific dishes include kadhi, pakora, besan masala roti, bajra aloo roti, churma, kheer, bathua raita, methi gajar, singri ki sabzi, and tamatar chutney. In the olden days, its staple diet included, bajra khichdi, rabdi, onion chutney, milet roti and bajra roti. In the non-veg cuisine it includes kukad kadhai and masala gravy chicken. Lassi, sharbat, nimbu pani and "labsi(which is a mixture of bajra flour and lassi) are three popular nonalcoholic beverages in Haryana. Liquor stores are common there, which cater to a large number of truck drivers. The daily diet of Himachal people is similar to that of the rest of North India, including lentils, broth, rice, vegetables, and bread, although nonvegetarian cuisine is preferred. Some of the specialities of Himachal include sidu, patande, chukh, rajmah, and til chutney. 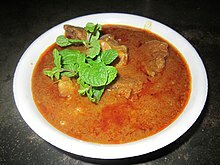 Rogan josh is a popular Kashmiri dish. The cuisine of Jammu and Kashmir is from three regions of the state: Jammu, Kashmir, and Ladakh. Kashmiri cuisine has evolved over hundreds of years. Its first major influence was the food of the Kashmiri Hindus and Buddhists. The cuisine was later influenced by the cultures which arrived with the invasion of Kashmir by Timur from the area of modern Uzbekistan. Subsequent influences have included the cuisines of Central Asia and the North Indian plains. The most notable ingredient in Kashmiri cuisine is mutton, of which over 30 varieties are known. Wazwan is a multicourse meal in the Kashmiri tradition, the preparation of which is considered an art. Kashmiri Pandit food is elaborate, and an important part of the Pandits' ethnic identity. Kashmiri Pandit cuisine usually uses dahi (yogurt), oil, and spices such as turmeric, red chilli, cumin, ginger, and fennel, though they do not use onion and garlic. Also, birayanis are quite popular here. They are the speciality of Kashmir. 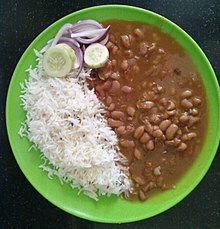 The Jammu region is famous for its Sund Panjeeri, Patisa, Rajma ( Kidney Beans) with rice and Kalari cheese. Dogri food includes ambal (sour pumpkin dish), khatta meat, Kulthein (Macrotyloma uniflorum) di dal, dal chawal, maa da madra and Uriya. Many types of pickles are made including mango, kasrod, and girgle. 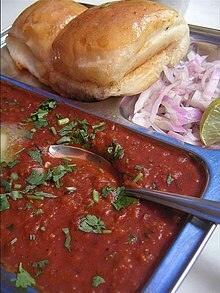 Street food is also famous which include various types of chaats, specially Gol Gappas, Gulgule, Chole Bhature, Rajma Kulcha and Dahi Bhalla. Staple food in Jharkhand are rice, dal and vegetable. Famous dishes include Chirka roti, Pittha, Malpua, Dhuska, Arsa roti and Litti Chokha. Local alcoholic drinks include Handia a rice beer and Mahua daru, made from flowers of the "Mahua" tree (Madhuca longifolia). A number of dishes, such as idli, rava idli, Mysore masala dosa, etc. were invented here and have become popular beyond the state of Karnataka. Equally, varieties in the cuisine of Karnataka have similarities with its three neighbouring South Indian states, as well as the states of Maharashtra and Goa to its north. It is very common for the food to be served on a banana leaf, especially during festivals and functions. Karnataka cuisine can be very broadly divided into: 1) Mysore/Bangalore cuisine, 2) North Karnataka cuisine, 3) Udupi cuisine, 4) Kodagu/Coorg cuisine, and 5) Karavali/coastal cuisine. The cuisine covers a wide spectrum of food from pure vegetarian and vegan to meats like pork, and from savouries to sweets. Typical dishes include bisi bele bath, jolada rotti, badanekai yennegai, Holige, Kadubu, chapati, idli vada, ragi rotti, akki rotti, saaru, huli, kootu, vangibath, khara bath, kesari bhath, sajjige, neer dosa, mysoore, haal bai, chiroti, benne dose, ragi mudde, and uppittu. The Kodagu district is known for spicy pork curries, while coastal Karnataka specialises in seafood. Although the ingredients differ regionally, a typical Kannadiga oota (Kannadiga meal) is served on a banana leaf. The coastal districts of Dakshina Kannada and Udupi have slightly varying cuisines, which make extensive use of coconut in curries and frequently include seafood. A full-course Sadya is the ceremonial meal of Kerala eaten usually on celebrations (like Onam, Vishu, etc.) and is served on a plantain leaf. Traditional food of Kerala Hindus is vegetarian, with regional exceptions such as the food of the Malabar area. It includes Kerala sadhya, which is an elaborate vegetarian banquet prepared for festivals and ceremonies. Contemporary Kerala food also includes nonvegetarian dishes. 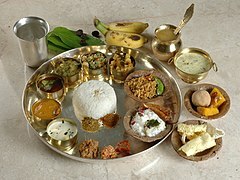 A full-course sadya, which consists of rice with about 20 different accompaniments and desserts is the ceremonial meal, eaten usually on celebrations such as marriages, Onam, Vishu, etc. and is served on a plantain leaf. 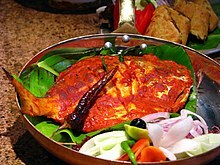 Fish and seafood play a major role in Kerala cuisine, as Kerala is a coastal state. An everyday Kerala meal in most households consists of rice with fish curry made of sardines, mackerel, seer fish, king fish, pomfret, prawns, shrimp, sole, anchovy, parrotfish, etc. (mussels, oysters, crabs, squid, scallops etc. are not rare), vegetable curry and stir-fried vegetables with or without coconut traditionally known as thoran or mizhukkupiratti. As Kerala has large inland water bodies, freshwater fish are abundant, and constitute regular meals. It is common in Kerala to have a breakfast with nonvegetarian dishes in restaurants, in contrast to other states in India. Chicken/mutton stews, lamb/chicken/beef/pork/egg curry, fish curry with tapioca for breakfast are common. A wide range of breakfast with non-vegetarian is common in Malabar and in Central Kerala. Kerala cuisine reflects its rich trading heritage. Over time, various cuisines have blended with indigenous dishes, while foreign ones have been adapted to local tastes. Significant Arab, Syrian, Portuguese, Dutch, Jewish, and Middle Eastern influences exist in this region's cuisine, through ancient trade routes via the Arabian Sea and through Arab traders who settled here, contributed to the evolution of kozhikodan halwa along with other dishes like Thalassery biryani. Coconuts grow in abundance in Kerala, so grated coconut and coconut milk are commonly used for thickening and flavouring. Kerala's long coastline and numerous rivers have led to a strong fishing industry in the region, making seafood a common part of the meal. Rice is grown in abundance, along with tapioca. It is the main starch ingredient used in Kerala's food. Having been a major production area of spices for thousands of years, the region makes frequent use of black pepper, cardamom, clove, ginger, and cinnamon. Most of Kerala's Hindus, except its Brahmin community, eat fish, chicken, beef, pork, eggs, and mutton. The Brahmin is famed for its vegan cuisine, especially varieties of sambar and rasam. 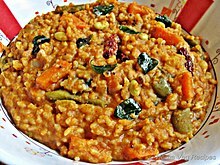 A thick vegetable stew popular in South and Central India called avial is believed to have originated in southern Kerala. Avial is a widely eaten vegetarian dish in the state and plays a major role in sadya. In most Kerala households, a typical meal consists of rice and vegetables. Kerala also has a variety of breakfast dishes like idli, dosa, appam, idiyappam, puttu, and pathiri. The Muslim community of Kerala blend Arabian, North Indian, and indigenous Malabari cuisines, using chicken, eggs, beef, and mutton.Thalassery biryani is the only biryani variant, which is of Kerala origin having originated in Talassery, in Malabar region. The dish is significantly different from other biryani variants. The Pathanamthitta region is known for raalan and fish curries. Appam along with wine and curries of cured beef and pork are popular among Syrian Christians in Central Kerala. Popular desserts are payasam and halwa. The Hindu community's payasams, especially those made at temples, like the Ambalappuzha temple, are famous for their rich taste. Halva is one of the most commonly found or easily recognised sweets in bakeries throughout Kerala, and Kozhikode is famous for its unique and exotic haluva, which is popularly known as Kozhikodan haluva. Europeans used to call the dish "sweetmeat" due to its texture, and a street in Kozhikode where became named Sweet Meat Street during colonial rule. Kozhikodan haluva is mostly made from maida (highly refined wheat), and comes in various flavours, such as banana, ghee or coconut. However, karutha haluva (black haluva) made from rice is also very popular. Many Muslim families in the region are famed for their traditional karutha haluva. The cuisine of Lakshadweep prominently features seafood and coconut. Local food consists of spicy nonvegetarian and vegetarian dishes. The culinary influence of Kerala is quite evident in the cuisines of Lakshadweep, since the island lies in close proximity to Kerala. Coconut and sea fish serve as the foundations of most of the meals. The people of Lakshadweep drink large amounts of coconut water, which is the most abundant aerated drink on the island. Coconut milk is the base for most of the curries. All the sweet or savory dishes have a touch of famous Malabar spices. Local people also prefer to have dosa, idlis, and various rice dishes. The cuisine in Madhya Pradesh varies regionally. Wheat and meat are common in the north and west of the state, while the wetter south and east are dominated by rice and fish. Milk is a common ingredient in Gwalior and Indore. The street food of Indore is well known, with shops that have been active for generations. Bhopal is known for meat and fish dishes such as rogan josh, korma, qeema, biryani, pilaf, and kebabs. On a street named Chatori Gali in old Bhopal, one can find traditional Muslim nonvegetarian fare such as paya soup, bun kabab, and nalli-nihari as some of the specialties. Dal bafla is a common meal in the region and can be easily found in Indore and other nearby regions, consisting of a steamed and grilled wheat cake dunked in rich ghee, which is eaten with daal and ladoos. The culinary specialty of the Malwa and Indore regions of central Madhya Pradesh is poha (flattened rice); usually eaten at breakfast with jalebi. Beverages in the region include lassi, beer, rum and sugarcane juice. A local liquor is distilled from the flowers of the mahua tree. Date palm toddy is also popular. In tribal regions, a popular drink is the sap of the sulfi tree, which may be alcoholic if it has fermented. Maharashtrian cuisine is an extensive balance of many different tastes. It includes a range of dishes from mild to very spicy tastes. Bajri, wheat, rice, jowar, vegetables, lentils, and fruit form important components of the Maharashtrian diet. Popular dishes include puran poli, ukdiche modak, batata wada, sabudana khichdi, masala bhat, pav bhaji, and wada pav. Poha or flattened rice is also usually eaten at breakfast. Kanda poha and aloo poha are some of the dishes cooked for breakfast and snacking in evenings. Popular spicy meat dishes include those that originated in the Kolhapur region. These are the Kolhapuri Sukka mutton, pandhra rassa, and tabmda rassa. Shrikhand, a sweet dish made from strained yogurt, is a main dessert of Maharashtrian cuisine. The cuisine of Maharashtra can be divided into two major sections—the coastal and the interior. The Konkan, on the coast of the Arabian Sea, has its own type of cuisine, a homogeneous combination of Malvani, Goud Saraswat Brahmin, and Goan cuisine. In the interior of Maharashtra, the Paschim Maharashtra, Khandesh, Vidarbha and Marathwada areas have their own distinct cuisines. The cuisine of Vidarbha uses groundnuts, poppy seeds, jaggery, wheat, jowar, and bajra extensively. A typical meal consists of rice, roti, poli, or bhakar, along with varan and aamtee—lentils and spiced vegetables. Cooking is common with different types of oil. Savji food from Vidarbha is well known all over Maharashtra. Savji dishes are very spicy and oily. Savji mutton curries are very famous. Like other coastal states, an enormous variety of vegetables, fish, and coconuts exists, where they are common ingredients. Peanuts and cashews are often served with vegetables. Grated coconuts are used to flavour many types of dishes, but coconut oil is not widely used; peanut oil is preferred. Kokum, most commonly served chilled, in an appetiser-digestive called sol kadhi, is prevalent. During summer, Maharashtrians consume panha, a drink made from raw mango. Malwani cuisine is a specialty of the tropical area which spans from the shore of Deogad Malwan to the southern Maharashtrian border with Goa. The unique taste and flavor of Malwani cuisine comes from Malwani masala and use of coconut and kokam. The staple foods are rice and fish. Various kinds of red and green fish, prawns, crab, and shellfish curries (also called mashacha sar in the Malwani language) are well known, along with kombadi (chicken) wade and mutton prepared Malwani style. Mohari mutton is also one of the distinct delicacies of Malwani cuisine. A large variety of fish is available in the region, which include surmai, karali, bangada, bombil(Bombay duck), paplet (pompret), halwa, tarali, suandale, kolambi (prawns), tisari (shell fish), kalwa (stone fish) and kurli (crab). All these fish are available in dried form, including prawns, which are known as sode. Local curries and chatanis are also prepared with dried fish. Different types of rice breads and pancakes add to the variety of Malwani cuisine and include tandlachi bhakari, ghawane, amboli, patole, appe, tandalachi and shavai (rice noodles). These rice breads can be eaten specially flavored with coconut milk, fish curries, and chicken or mutton curries. Sole kadi made from kokam and coconut milk is a signature appetizer drink . For vegetarians, Malwani delicacies include alloochi bhaji, alloochi gathaya, kalaya watanyacha, and sambara(black gram stew). The sweets and desserts include ukadiche modak, Malawani khaje, khadakahde kundiche ladu, shegdanyache ladu, tandalchi kheer, and tandalachi shavai ani ras (specially flavored with coconut milk). Manipuri cuisine is represented by the cuisine of the Meitei people who form the majority population in the central plain. Meitei food are simple, tasty, organic and healthy. Rice with local seasonal vegetables and fish form the main diet. Most of the dishes are cooked like vegetable stew, flavored with either fermented fish called ngari, or dried and smoked fish. The most popular manipuri dish is the Eromba; it's a preparation of boiled and mashed vegetables, often including potatoes or beans, mixed with chilli and roasted fermented fish. Another popular dish is the savory cake called Paknam, made of a base of lentil flour stuffed with various ingredients such as banana inflorescence, mushrooms, fish, vegetables etc., and baked covered in turmeric leaves. Along with spicy dishes, a mild side dish of steamed or boiled sweet vegetables are often served in the daily meals. The manipuri salad dish called singju, made of finely julienned cabbage, green papaya, and other vegetables, and garnished with local herbs, toasted sesame powder and lentil flour is extremely popular locally, and often found sold in small street side vendors. Singju is often served with bora which are fritters of various kinds, and also kanghou, or oil fried spicy veggies. Cooked and fermented soybean is a popular condiment in all manipuri kitchens. The staple diet of Manipur consists of rice, fish, large varieties of leafy vegetables (of both aquatic and terrestrial). Manipuris typically raise vegetables in a kitchen garden and rear fishes in small ponds around their house. Since the vegetables are either grown at home or obtained from local market, the cuisines are very seasonal, each season having its own special vegetables and preparations. The taste is very different from mainland Indian cuisines because of the use of various aromatic herbs and roots that are peculiar to the region. They are however very similar to the cuisines of Southeast/East/Central Asia, Siberia, Micronesia and Polynesia. Meghalayan cuisine is unique and different from other Northeastern Indian states. Spiced meat is common, from goats, pigs, fowl, ducks, chickens, and cows. In the Khasi and Jaintia Hills districts, common foods include jadoh, ki kpu, tung-rymbai, and pickled bamboo shoots. Other common foods in Meghalaya include minil songa (steamed sticky rice), sakkin gata, and momo dumplings. Like other tribes in the northeast, the Garos ferment rice beer, which they consume in religious rites and secular celebrations. The cuisine of Mizoram differs from that of most of India, though it shares characteristics to other regions of Northeast India and North India. Rice is the staple food of Mizoram, while Mizos love to add non-vegetarian ingredients in every dish. Fish, chicken, pork and beef are popular meats among Mizos. Dishes are served on fresh banana leaves. Most of the dishes are cooked in mustard oil. Meals tend to be less spicy than in most of India. Mizos love eating boiled vegetables along with rice. A popular dish is bai, made from boiling vegetables (spinach, eggplant, beans, and other leafy vegetables) with bekang fermented soya beans or Sa-um, a fermented pork and served with rice. Sawhchiar is another common dish, made of rice and cooked with pork or chicken. The cuisine of Nagaland reflects that of the Naga people. It is known for exotic pork meats cooked with simple and flavourful ingredients, like the extremely hot Bhut jolokia pepper, fermented bamboo shoots and akhuni or fermented soya beans. Another unique and strong ingredient used by the Naga people, is the fermented fish known as ngari. Fresh herbs and other local greens also feature prominently in the Naga cuisine. The Naga use oil sparingly, preferring to ferment, dry, and smoke their meats and fish. Traditional homes in Nagaland have external kitchens that serve as smokehouses. A typical meal consists of rice, meat, a chutney, a couple of stewed or steamed vegetable dishes – flavored with ngari or akhuni. Desserts usually consist of fresh fruits. Oriya mutton curry (mansha tarkari). The cuisine of Odisha relies heavily on local ingredients. Flavours are usually subtle and delicately spiced, unlike the spicy curries typically associated with Indian cuisine. Fish and other seafood, such as crab and shrimp, are very popular, and chicken and mutton are also consumed. Panch phutana, a mix of cumin, mustard, fennel, fenugreek and kalonji (nigella), is widely used for flavouring vegetables and dals, while garam masala and turmeric are commonly used for meat-based curries. Pakhala, a dish made of rice, water, and dahi (yogurt), that is fermented overnight, is very popular in summer in rural areas. Oriyas are very fond of sweets, so dessert follows most meals. Few popular Oriya cuisines, Anna, Kanika, Dalma, Khata (Tamato & Oou), Dali (Different types of lentils, i.e. Harada (Red Gram), known as Arhar in Hindi), Muga (Moong), Kolatha (Horsegram), etc. And many more varieties both in Veg. (Niramisha) & Non-Veg. (Aamisha). Saga ( spinach and other green leaves) and Alu-bharta(mashed potato) along with Pakhala are popular dishes(lunch) in rural Odisha. Odisha is well known for its milk-based sweets. Among the many Rasagula which originated in Odisha, Chhena poda, Chhena gaja, Chhena jhili, and Rasabali are very famous. The union territory of Puducherry was a French colony for around 200 years, making French cuisine a strong influence on the area. Tamil cuisine is eaten by the territory's Tamil majority. The influence of the neighbouring areas, such as Andhra Pradesh and Kerala, is also visible on the territory's cuisine. Some favourite dishes include coconut curry, tandoori potato, soya dosa, podanlangkai, curried vegetables, stuffed cabbage, and baked beans. 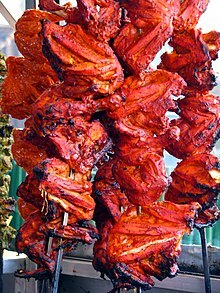 Tandoori chicken is a popular grilled dish. The cuisine of Punjab is known for its diverse range of dishes.The cuisine is closely related to the cuisine of the neighbouring Punjab province of Pakistan. The state, being an agriculture center, is abundant with whole grains, vegetables, and fruits. Home-cooked and restaurant Punjabi cuisine can vary significantly. Restaurant-style Punjabi cooking puts emphasis on creamy textured foods by using ghee, butter and cream while, home-cooked meals center around whole wheat, rice, and other ingredients flavored with various kinds of masalas. Common dishes cooked at home are roti with daal and dahi (yogurt) with a side chutney and salad that includes raw onion, tomato, cucumber, etc. The meals are also abundant of local and seasonal vegetables usually sautéed with spices such as cumin, dried coriander, red chili powder, turmeric, black cloves, etc. Masala Chai is a favorite drink and is consumed in everyday life and at special occasions. Many regional differences exist in the Punjabi cuisine based on traditional variations in cooking similar dishes, food combinations, preference of spice combination, etc. Is it apparent that "the food is simple, robust, and closely linked to the land." Certain dishes exclusive to Punjab, such as makki di roti and sarson da saag, dal makhani, etc. are a favorite of many. The masala in a Punjabi dish traditionally consists of onion, garlic, ginger, cumin, garam masala, salt, turmeric, tomatoes sauteed in mustard oil. Tandoori food is a Punjabi specialty. Common meat dishes in this region are Bhakra curry (Goat) and fish dishes Dairy products are commonly consumed and usually accompany main meals in the form of dahi, milk, and milk derived products such as lassi, paneer, etc. Punjab consists of a high number of people following the Sikh religion who traditionally follow a vegetarian diet (which includes plant derived foods, milk, and milk by-products. See diet in Sikhism) in accordance to their beliefs. No description of Punjabi cuisine is complete without the myriad of famous desserts, such as kheer, gajar ka halwa, sooji (cream of wheat) halwa, rasmalai, gulab jamun and jalebi. Most desserts are ghee or dairy-based, use nuts such as almonds, walnuts, pistachios, cashews, and, raisins. Many of the most popular elements of Anglo-Indian cuisine, such as tandoori foods, naan, pakoras and vegetable dishes with paneer, are derived from Punjabi styles. Punjabi food is well liked in the world for its flavors, spices, and, versatile use of produce; and hence it is one of the most popular cuisine's from the sub continent. And last but not least is the Chhole Bhature and Chhole Kulche which are famous all over the north India. Cooking in Rajasthan, an arid region, has been strongly shaped by the availability of ingredients. 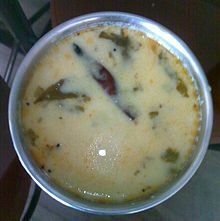 Food is generally cooked in milk or ghee, making it quite rich. Gram flour is a mainstay of Marwari food mainly due to the scarcity of vegetables in the area. Historically, food that could last for several days and be eaten without heating was preferred. Major dishes of a Rajasthani meal may include daal-baati, tarfini, raabdi, Ghevar, bail-gatte, panchkoota, chaavadi, laapsi, kadhi and boondi. Typical snacks include bikaneri bhujia, mirchi bada, Pyaaj Kachori, and Dal Kachori. 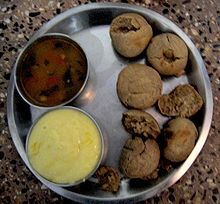 Daal-baati is the most popular dish prepared in the state. It is usually supplemented with choorma, a mixture of finely ground baked rotis, sugar and ghee. Rajasthan is also influenced by the Rajput community who have liking for meat dishes.Their diet consisted of game meat and gave birth to dishes like laal maas, safed maas, khad khargosh and jungli maas. In Sikkim, various ethnic groups such as the Nepalese, Bhutias, and Lepchas have their own distinct cuisines. Nepalese cuisine is very popular in this area. Rice is the staple food of the area, and meat and dairy products are also widely consumed. For centuries, traditional fermented foods and beverages have constituted about 20 percent of the local diet. Depending on altitudinal variation, finger millet, wheat, buckwheat, barley, vegetables, potatoes, and soybeans are grown. Dhindo, Daal bhat, Gundruk, Momo, gya thuk, ningro, phagshapa, and sel roti are some of the local dishes. Alcoholic drinks are consumed by both men and women. Beef is eaten by the Bhutias. Sindhi cuisine refers to the native cuisine of the Sindhi people from the Sindh region, now in Pakistan. While Sindh is not geographically a part of modern India, its culinary traditions persist, due to the sizeable number of Hindu Sindhis who migrated to India following the independence of Pakistan in 1947, especially in Sindhi enclaves such as Ulhasnagar and Gandhidam. A typical meal in most Sindhi households consists of wheat-based flatbread (phulka) and rice accompanied by two dishes, one with gravy and one dry. Lotus stem (known as kamal kakri) is also used in Sindhi dishes. Cooking vegetables by deep frying is a common practice that is followed. Some common Sindhi dishes are Sindhi Kadhi, Sai Bhaji, Koki and Besan Bhaji. Some common ingredients used are mango powder, tamarind, kokum flowers, and dried pomegranate seeds. Tamil Nadu is noted for its deep belief that serving food to others is a service to humanity, as is common in many regions of India. The region has a rich cuisine involving both traditional non-vegetarian and vegetarian dishes. Tamil food is characterised by its use of rice, legumes, and lentils, along with distinct aromas and flavours achieved by the blending of spices such as mustard, curry leaves, tamarind, coriander, ginger, garlic, chili pepper, cinnamon, clove, cardamom, cumin, nutmeg, coconut and rose water. The traditional way of eating a meal involves being seated on the floor, having the food served on a plantain leaf, and using the right hand to eat. After the meal the plantain leaf is discarded but becomes food for free-ranging cattle and goats. A meal (called Saapadu) consists of rice with other typical Tamil dishes on a plantain leaf. A typical Tamilian would eat on a plantain leaf as it is believed to give a different flavour and taste to food. Also growing in popularity are stainless steel trays – plates with a selection of different dishes in small bowls. Tamil food is characterized by tiffin, which is a light food taken for breakfast or dinner, and meals which are usually taken during lunch. The word "curry" is derived from the Tamil kari, meaning something similar to "sauce". The southern regions such as Tirunelveli, Madurai, Paramakudi, Karaikudi, and Chettinad,Kongu Nadu are noted for their spicy non-vegetarian dishes. Dosa, idli, pongal and Biryani are some of the popular dishes that are eaten with chutney and sambar. Fish and other seafoods are also very popular, because the state is located on the coast. Chicken and goat meat are the predominantly consumed meats in Tamil Nadu. Many Tamilians are vegetarian, however, and the typical meal is heavily dependent on rice, vegetables and lentil preparations such as rasam and sambar. There are further variations of Tamil vegetarian dishes. They have influenced Kerala as well in their Kootu, Arachi vitta sambhar and molagootals. As mentioned above, the Chettinad variety of food uses lots of strong spices, such as pepper, garlic, fennel seeds and onions. Tamil food tends to be spicy compared to other parts of India so there is a tradition of finishing the meal with dahi (yogurt) is considered a soothing end to the meal. Notably, Tamil Brahmin cuisine, the food of the Iyers and Iyengar community, is characterized by slightly different meal times and meal structures compared to other communities within the state. Historically vegetarian, the cuisine is known for its milder flavor and avoidance of onion and garlic (although this practice appears to be disappearing with time). After a light morning meal of filter coffee and different varieties of porridges (oatmeal and janata kanji are immensely popular), the main meal of the day, lunch/brunch is usually at 11 am and typically follows a two-three course meal structure. Steamed rice is the main dish, and is always accompanied by a seasonally steamed/sauteed vegetable (poriyal), and two or three types of tamarind stews, the most popular being sambhar and rasam. The meal typically ends with thair sadham (rice with yogurt), usually served with pickled mangoes or lemons. Tiffin is the second meal of the day and features several breakfast favorites such as idli, rava idli, upma, dosa varieties, vada and is usually accompanied by chai. Dinner is the simplest meal of the day, typically involving leftovers from either lunch or tiffin. Fresh seasonal fruit consumed in the state include bananas, papaya, honeydew and canteloupe melons, jackfruit, mangos, apples, kasturi oranges, pomegranates, and nongu (hearts of palm). The cuisine of Telangana consists of the Telugu cuisine, of Telangana's Telugu people as well as Hyderabadi cuisine (also known as Nizami cuisine), of Telangana's Hyderabadi Muslim community. Hyderabadi food is based heavily on non-vegetarian ingredients, while Telugu food is a mix of both vegetarian and non-vegetarian ingredients. Telugu food is rich in spices and chillies are abundantly used. The food also generally tends to be more on the tangy side with tamarind and lime juice both used liberally as souring agents. Rice is the staple food of Telugu people. Starch is consumed with a variety of curries and lentil soups or broths. Vegetarian and non-vegetarian foods are both popular. Hyderabadi cuisine includes popular delicacies such as Biryani, Haleem, Baghara baingan and Kheema, while Hyderabadi day to day dishes see some commonalities with Telanganite Telugu food, with its use of tamarind, rice, and lentils, along with meat. Dahi (yogurt) is a common addition to meals, as a way of tempering spiciness. The Tripuri people are the original inhabitants of the state of Tripura in northeast India. Today, they comprise the communities of Tipra, Reang, Jamatia, Noatia, and Uchoi, among others. The Tripuri are non-vegetarian, although they have a minority of Vaishnavite vegetarians. The major ingredients of Tripuri cuisine include vegetables, herbs, pork, chicken, mutton, fishes, turtle, shrimps, crabs, freshwater mussels, periwinkles, edible freshwater snails and frogs. 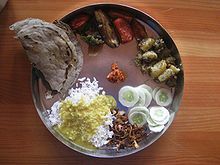 Traditionally, Uttar Pradeshi cuisine consists of Awadhi and Mughlai cuisine, though a vast majority of the state is vegetarian, preferring dal, roti, sabzi, and rice. Pooris and kachoris are eaten on special occasions. Chaat, samosa, and pakora, among the most popular snacks in India, originate from Uttar Pradesh. Well known dishes include kebabs, dum biryani, and various mutton recipes. Sheer Qorma, Ghevar, Gulab jamun, Kheer, and Ras malai are some of the popular desserts in this region. Awadhi cuisine (Hindi: अवधी खाना) is from the city of Lucknow, which is the capital of the state of Uttar Pradesh in Central-South Asia and Northern India, and the cooking patterns of the city are similar to those of Central Asia, the Middle East, and other parts of Northern India. The cuisine consists of both vegetarian and non-vegetarian dishes. Awadh has been greatly influenced by Mughal cooking techniques, and the cuisine of Lucknow bears similarities to those of Central Asia, Kashmir, Punjab and Hyderabad. The city is also known for its Nawabi foods. The bawarchis and rakabdars of Awadh gave birth to the dum style of cooking or the art of cooking over a slow fire, which has become synonymous with Lucknow today. Their spread consisted of elaborate dishes like kebabs, kormas, biryani, kaliya, nahari-kulchas, zarda, sheermal, roomali rotis, and warqi parathas. The richness of Awadh cuisine lies not only in the variety of cuisine but also in the ingredients used like mutton, paneer, and rich spices, including cardamom and saffron. Mughlai cuisine is a style of cooking developed in the Indian subcontinent by the imperial kitchens of the Mughal Empire. 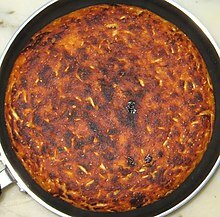 It represents the cooking styles used in North India (especially Uttar Pradesh). The cuisine is strongly influenced by the Central Asian cuisine, the region where the Chagatai-Turkic Mughal rulers originally hailed from, and it has in turn strongly influenced the regional cuisines of Kashmir and the Punjab region. The tastes of Mughlai cuisine vary from extremely mild to spicy, and is often associated with a distinctive aroma and the taste of ground and whole spices. A Mughlai course is an elaborate buffet of main course dishes with a variety of accompaniments. Saag, a popular Kumauni dish from Uttarakhand, is made from any of the various green vegetables like spinach and fenugreek. The food from Uttrakhand is known to be healthy and wholesome to suit the high-energy necessities of the cold, mountainous region. It is a high protein diet that makes heavy use of pulses and vegetables. Traditionally it is cooked over wood or charcoal fire mostly in iron utensils. While also making use of condiments such as jeera, haldi and rai common in other Indian cuisines, Uttarakhand cuisine uses some exotic condiments like jambu, timmer, ghandhraini and bhangira. Similarly, although the people in Uttarakhand also prepare the dishes common in other parts of northern India, several preparations are unique to Uttarakhand tradition such as rus, chudkani, dubuk, chadanji, jholi, kapa, etc. Among dressed salads and sauces, kheere ka raita, nimbu mooli ka raita, daarim ki khatai and aam ka fajitha necessarily deserve a mention. The cuisine mainly consists of food from two different sub regions—Garhwal and Kumaon—though their basic ingredients are the same. Both the Kumaoni and Garhwali styles make liberal use of ghee, lentils or pulses, vegetables and bhaat (rice). They also use Badi (sun-dried Urad Dal balls) and Mungodi (sun-dried Moong Dal balls) as substitutes for vegetables at times. During festivals and other celebrations, the people of Uttarakhand prepare special refreshments which include both salty preparations such as bada and sweet preparations such as pua and singal. Uttarakhand also has several sweets (mithai) such as singodi, bal-mithai, malai laddu, etc. native to its tradition. During the 19th century, many Odia-speaking cooks were employed in Bengal, which led to the transfer of several food items between the two regions. Bengali cuisine is the only traditionally developed multi-course tradition from the Indian subcontinent that is analogous in structure to the modern service à la russe style of French cuisine, with food served course-wise rather than all at once. Bengali cuisine differs according to regional tastes, such as the emphasis on the use of chilli pepper in the Chittagong district of Bangladesh However, across all its varieties, there is predominant use of mustard oil along with large amounts of spices. The cuisine is known for subtle flavours with an emphasis on fish, meat, vegetables, lentils, and rice. Bread is not a common dish in Bengali cuisine, but a deep fried version called luchi is popular. Fresh sweetwater fish is one of its most distinctive features; Bengalis prepare fish in many ways, such as steaming, braising, or stewing in vegetables and sauces based on coconut milk or mustard. East Bengali food, which has a high presence in West Bengal and Bangladesh, is much spicier than the West Bengali cuisine, and tends to use high amounts of chilli, and is one of the spiciest cuisines in India and the World. Shondesh and Rasgulla are popular sweet dishes made of sweetened, finely ground fresh cheese. The "Jaggery Rasgullas" are even more famous. The rasgulla originated in Bengal. and later became popular in erstwhile Odisha. The government of west Bengal has recently acquired the GI status of rasgulla after citing proof in court. The cuisine is also found in the state of Tripura and the Barak Valley of Assam. The interaction of various Indian diaspora communities with the native cultures of their domiciles have resulted in the creation of many fusion cuisines, which blend aspects of Indian and foreign cuisines. These cuisines tend to adapt Indian seasoning and cooking techniques to foreign dishes. Indian Chinese cuisine, also known as Indo-Chinese cuisine originated in the 19th century among the Chinese community of Calcutta, during the immigration of Hakka Chinese from Canton (present-day Guangzhou) seeking to escape the First and Second Opium Wars and political instability in the region. Upon exposure to local Indian cuisine, they incorporated many spices and cooking techniques into their own cuisine, thus creating a unique fusion of Indian and Chinese cuisine. After 1947, many Cantonese immigrants fleeing political repression under Mao Zedong, opened their own restaurants in Calcutta, whose dishes combined aspects of Indian cuisine with Cantonese cuisine. While Indian Chinese cuisine is heavily derived from traditional Chinese cuisine, it bears little resemblance to its Chinese counterpart. The dishes tend to be flavoured with cumin, coriander seeds, and turmeric, which with a few regional exceptions, are not traditionally associated with Chinese cuisine. Chilli, ginger, garlic and dahi (yogurt) are also frequently used in dishes. Popular dishes include Chicken Manchurian, Chicken lollipop, Chilli chicken, Hakka noodles, Hunan chicken, Chow mein, and Szechwan fried rice. Soups such as Manchow soup and Sweet corn soup are very popular, whereas desserts include ice cream on honey-fried noodles and date pancakes. Chow mein is now known as one of the most favorite Chinese dishes in India. Especially in West Bengal, it is one of the most loved street foods. Indian Singaporean cuisine refers to foods and beverages produced and consumed in Singapore that are derived, wholly or in part, from South Asian culinary traditions. The great variety of Singaporean food includes Indian food, which tends to be Tamil cuisine, especially local Tamil Muslim cuisine, although North Indian food has become more visible recently. Indian dishes have become modified to different degrees, after years of contact with other Singaporean cultures, and in response to locally available ingredients, as well as changing local tastes. Indian-Indonesian cuisine refers to food and beverages in Indonesian cuisine that are have influenced of Indian cuisine—especially from Tamil, Punjabi, and Gujarati cuisine. These dishes are well integrated. Anglo-Indian cuisine is the cuisine that developed during the British Raj in India, as the British wives interacted with their Indian cooks. Well-known Anglo-Indian dishes include chutneys, salted beef tongue, kedgeree, ball curry, fish rissoles, and mulligatawny soup. Phirni and Kheer are two of the most popular rice puddings in India. Many Indian desserts, or mithai, are fried foods made with sugar, milk or condensed milk. Ingredients and preferred types of dessert vary by region. In the eastern part of India, for example, most are based on milk products. Many are flavoured with almonds and pistachios, spiced with cardamon, nutmeg, cloves and black pepper, and decorated with nuts, or with gold or silver leaf. Popular Indian desserts include Rasogolla, gulab jamun, jalebi, laddu, peda etc. A cup of Darjeeling tea. Lassi served at an Indian restaurant. Indian filter coffee is popular in Southern India. Tea is a staple beverage throughout India, since the country is one of the largest producers of tea in the world. The most popular varieties of tea grown in India include Assam tea, Darjeeling tea and Nilgiri tea. It is prepared by boiling the tea leaves in a mix of water, milk, and spices such as cardamom, cloves, cinnamon, and ginger. In India, tea is often enjoyed with snacks like biscuits and pakoda. Coffee is another popular beverage, but more popular in South India. Coffee is also cultivated in some parts of India. There are two varieties of coffee popular in India, which include Indian filter coffee and instant coffee. Lassi is a traditional dahi (yogurt)-based drink in India. It is made by blending yogurt with water or milk and spices. 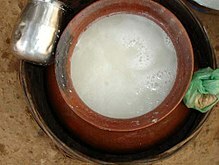 Salted lassi is more common in villages of Punjab and in Porbandar, Gujarat. Traditional lassi is sometimes flavoured with ground roasted cumin. Lassi can also be flavoured with ingredients such as sugar, rose water, mango, lemon, strawberry, and saffron. Sharbat is a sweet cold beverage prepared from fruits or flower petals. It can be served in concentrate form and eaten with a spoon, or diluted with water to create a drink. Popular sharbats are made from plants such as rose, sandalwood, bel, gurhal (hibiscus), lemon, orange, pineapple, sarasaparilla and falsa (Grewia asiatica). In Ayurveda, sharbats are believed to hold medicinal value. Most beers in India are either lagers (4.8 percent alcohol) or strong lagers (8.9 percent). The Indian beer industry has witnessed steady growth of 10–17 percent per year over the last ten years. Production exceeded 170 million cases during the 2008–2009 financial year. With the average age of the population decreasing and income levels on the rise, the popularity of beer in the country continues to increase. Other popular alcoholic drinks in India include fenny, a Goan liquor made from either coconut or the juice of the cashew apple. The state of Goa has registered for a geographical indicator to allow its fenny distilleries to claim exclusive rights to production of liquor under the name "fenny." Hadia is a rice beer, created by mixing herbs with boiled rice and leaving the mixture to ferment for around a week. It is served cold and is less alcoholic than other Indian liquors. Chuak is a similar drink from Tripura. Palm wine, locally known as Neera, is a sap extracted from inflorescences of various species of toddy palms. Chhaang is consumed by the people of Sikkim and the Darjeeling Himalayan hill region of West Bengal. It is drunk cold or at room temperature in summer, and often hot during cold weather. Chhaang is similar to traditional beer, brewed from barley, millet, or rice. Kallu(Chetthu Kallu) is a popular natural alcohol extracted from coconut and pine trees in Kerala. It is sold in local Kallu shops and is consumed with fried fish and chicken. Its alcoholic content is increased by addition of alcoholic additives. 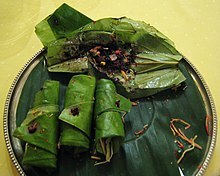 Paan is often eaten after a meal. Indians consider a healthy breakfast important. They generally prefer to drink tea or coffee with breakfast, though food preferences vary regionally. North Indian people prefer roti, parathas, and a vegetable dish accompanied by achar (a pickle) and some curd. Various types of packaged pickles are available in the market. One of the oldest pickle-making companies in India is Harnarains, which had started in the 1860s in Old Delhi. People of Gujarat prefer dhokla and milk, while south Indians prefer idli and dosa, generally accompanied by sambhar or sagu and various chutneys. Traditional lunch in India usually consists of a main dish of rice in the south and the east, and whole wheat rotis in the north. It typically includes two or three kinds of vegetables, and sometimes items such as kulcha, naan, or parathas. Paan (stuffed, spiced and folded betel leaves) which aids digestion is often eaten after lunch and dinner in many parts of India. Apart from that, many households, specially those in north and central India, prefer having sweets after the dinner (similar like the western concept of dessert after meals). Indian families often gather for "evening snack time", similar to tea time to talk and have tea and snacks. Dinner is considered the main meal of the day. Hindu communities consider beef taboo since it is believed that Hindu scriptures condemn cow slaughter. Cow slaughter has been banned in many states of India. Traditionally, meals in India were eaten while seated either on the floor or on very low stools or mattress. Food is most often eaten with the hands rather than cutlery. Often roti is used to scoop curry without allowing it to touch the hand. In the wheat-producing north, a piece of roti is gripped with the thumb and middle finger and ripped off while holding the roti down with the index finger. A somewhat different method is used in the south for the dosai, the adai, and the uththappam, where the middle finger is pressed down to hold the crepe down and the forefinger and thumb used to grip and separate a small part. Traditional serving styles vary regionally throughout India. As in the United Kingdom and the United States, Indian cuisine is widely available in Canada, especially in the cities of Toronto, Vancouver, and Ottawa where the majority of Canadians of South Asian heritage live. Indian food is gaining popularity in China, where there are many Indian restaurants in Beijing, Shanghai, and Shenzhen. Hong Kong alone has more than 50 Indian restaurants, some of which date back to the 1980s. Most of the Indian restaurants in Hong Kong are in Tsim Sha Tsui. The Indian culinary scene in the Middle East has been influenced greatly by the large Indian diaspora in these countries. Centuries of trade relations and cultural exchange resulted in a significant influence on each region's cuisines. The use of the tandoor, which originated in northwestern India, is an example. The large influx of Indian expatriates into the Middle Eastern countries during the 1970s and 1980s led to the booming of Indian restaurants to cater to this population and was also widely influenced by the local and international cuisines. Indian cuisine is available in the streets of Nepalese cities, including Kathmandu and Janakpur. Indian cuisine is very popular in Southeast Asia, due to the strong Hindu and Buddhist cultural influence in the region. Indian cuisine has had considerable influence on Malaysian cooking styles and also enjoys popularity in Singapore. 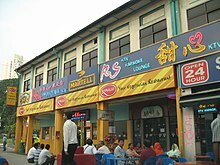 There are numerous North and South Indian restaurants in Singapore, mostly in Little India. Singapore is also known for fusion cuisine combining traditional Singaporean cuisine with Indian influences. Fish head curry, for example, is a local creation. Indian influence on Malay cuisine dates to the 19th century. Other cuisines which borrow inspiration from Indian cooking styles include Cambodian, Lao, Filipino, Vietnamese, Indonesian, Thai, and Burmese cuisines. The spread of vegetarianism in other parts of Asia is often credited to Hindu and Buddhist practices. 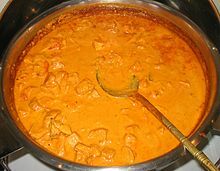 Chicken tikka masala, a modified version of Indian chicken tikka, has been called "a true British national dish." The UK's first Indian restaurant, the Hindoostanee Coffee House, opened in 1810. By 2003, there were as many as 10,000 restaurants serving Indian cuisine in England and Wales alone. According to Britain's Food Standards Agency, the Indian food industry in the United Kingdom is worth 3.2 billion pounds, accounts for two-thirds of all eating out and serves about 2.5 million customers every week. One of the best known examples of British Indian restaurant cuisine is Chicken tikka masala, which has also been called "a true British national dish." Ireland's first Indian restaurant, the Indian Restaurant and Tea Rooms, opened in 1908 on Sackville Street, now O'Connell Street, in Dublin. Today, Indian restaurants are commonplace in most Irish cities and towns. Non-Chinese Asians are the fastest growing ethnic group in Ireland. A survey by The Washington Post in 2007 stated that more than 1,200 Indian food products had been introduced into the United States since 2000. There are numerous Indian restaurants across the US, which vary based on regional culture and climate. North Indian and South Indian cuisines are especially well represented. Most Indian restaurants in the United States serve Americanized versions of North Indian food, which is generally less spicy than its Indian equivalents. At sit-down restaurants with North Indian cuisine (the most common), complimentary papadum is served with three dipping sauces − typically hari chutney (mint and cilantro), imli chutney (taramind), and a spicy red chili or onion chutney − in place of European-style bread before the meal. ^ Dias (1 January 1996). Steward, The. Orient Blackswan. p. 215. ISBN 978-81-250-0325-0. Retrieved 29 June 2012. ^ Gesteland, Richard R.; Gesteland, Mary C. (23 February 2010). India: Cross-cultural Business Behavior : for Business People, Expatriates and Scholars. Copenhagen Business School Press DK. p. 176. ISBN 978-87-630-0222-6. Retrieved 29 June 2012. ^ D Balasubramanian (16 October 2008). "Potato: historically important vegetable". The Hindu. Chennai, India. Retrieved 26 June 2012. ^ Cornillez, Louise Marie M. (Spring 1999). "The History of the Spice Trade in India". ^ a b "Nasi, Kari, Biryani & Mee". Veg Voyages. Retrieved 23 June 2009. ^ "Asia Food Features". Asiafood.org. Archived from the original on 25 May 2001. Retrieved 23 June 2009. ^ Krishna Gopal Dubey (2011). The Indian Cuisine. PHI Learning Pvt. Ltd. ISBN 978-81-203-4170-8. Retrieved 2 June 2012. ^ a b K T Achaya (2003). The Story of Our Food. Universities Press. Retrieved 18 June 2015. ^ "Chapter 17, Verse 8,9,10". Bhagavad-Gita. Retrieved 31 August 2011. ^ Donald K. Sharpes (2006). Sacred Bull, Holy Cow: A Cultural Study of Civilization's Most Important Animal. Peter Lang. p. 208. ISBN 978-0-8204-7902-6. Retrieved 4 June 2012. ^ "Beef eating: strangulating history". The Hindu. Chennai, India. 14 August 2001. ^ a b Matthew Locricchio; Jack McConnell (1 October 2004). The Cooking of India. Marshall Cavendish. p. 77. ISBN 978-0-7614-1730-9. Retrieved 2 June 2012. ^ Staelens, Stefanie. "The Bhang Lassi Is How Hindus Drink Themselves High for Shiva". Vice.com. Retrieved 10 August 2017. ^ Bruce F. Johnston (1958). The Staple Food Economies of Western Tropical Africa. Stanford University Press. p. 14. ISBN 978-0-8047-0537-0. Retrieved 2 June 2012. ^ Diana Seshadri (30 May 2007). Food for The Gods. Lulu.com. pp. 35–. ISBN 978-1-4303-1269-7. Retrieved 5 June 2012. ^ John Shi; Chi-Tang Ho; Fereidoon Shahidi (15 March 2010). Functional Foods of the East. CRC Press. pp. 64–. ISBN 978-1-4200-7192-4. Retrieved 5 June 2012. ^ Arvind Kumar; Pushpalata Dubey (1 January 2006). Green Technologies for Sustainable Agriculture. Daya Publishing House. pp. 28–. ISBN 978-81-7035-419-2. Retrieved 5 June 2012. ^ Dr. J. P. Sharma. Academic Biology IX. Laxmi Publications. p. 97. ISBN 978-81-7008-579-9. Retrieved 4 June 2012. ^ a b Subodh Kapoor (1 July 2002). The Indian Encyclopaedia. Cosmo Publications. p. 1745. ISBN 978-81-7755-257-7. Retrieved 4 June 2012. ^ Laura Kelley (15 July 2009). The Silk Road Gourmet: Western and Southern Asia. iUniverse. pp. 298–. ISBN 978-1-4401-4305-2. Retrieved 5 June 2012. ^ Priti Chitnis Gress (30 January 2008). Flavorful India: Treasured Recipes from a Gujarati Family. Hippocrene Books. pp. 15–. ISBN 978-0-7818-1207-8. Retrieved 4 June 2012. ^ Devagi Sanmugam (31 July 2007). Naturally Speaking: Indian: Recipes and Home Remedies. Marshall Cavendish. p. 69. ISBN 978-981-232-715-4. Retrieved 4 June 2012. ^ "Cuisines of Andaman and Nicobar Islands". Andaman and Nicobar Islands. indfy.com. Archived from the original on 22 April 2012. Retrieved 4 June 2012. ^ Man, Edward Horace; Ellis, Alexander John (1 January 1932). The Aboriginal Inhabitants of the Andaman Islands. Mittal Publications. ^ "AP cuisine". Andhra Pradesh. indiasite.com. Archived from the original on 25 June 2012. Retrieved 4 June 2012. ^ "Arunachal Pradesh staple food". Cuisine. amazingarunachal.com. Retrieved 4 June 2012. ^ "Arunachal Pradesh food". Arunachal Pradesh. ifood.tv. Archived from the original on 24 April 2013. Retrieved 4 June 2012. ^ "Cuisine". India cuisine. Incredible India. Archived from the original on 2 June 2012. Retrieved 4 June 2012. ^ Edgar Thorpe and Showick Thorpe, ed. (2010). The Pearson Concise General Knowledge Manual (New ed.). Pearson Education India. p. 34. ISBN 978-81-317-2766-9. ^ Assam General Knowledge. Bright Publications. pp. 79–. ISBN 978-81-7199-451-9. Retrieved 5 June 2012. ^ Rajatananda Das Gupta (1982). Art of mediaeval Assam. Cosmo. p. 171. Retrieved 5 June 2012. ^ Norman Mosley Penzer (1980). Poison-Damsels. Ayer Publishing. pp. 253–. ISBN 978-0-405-13336-7. Retrieved 11 June 2012. ^ a b Martin Hughes; Sheema Mookherjee; Richard Delacy (2001). World Food India. Lonely Planet. pp. 176–. ISBN 978-1-86450-328-9. Retrieved 5 June 2012. ^ Bhandari Laveesh (1 September 2009). Indian States at a Glance 2008–09: Performance, Facts And Figures – Bihar. Pearson Education India. pp. 30–. ISBN 978-81-317-2333-3. Retrieved 5 June 2012. ^ "Chhattisgarh Cuisine in India". India9.com. 7 June 2005. Retrieved 7 February 2011. "Mahua flower liquor". Fieldsite in Central India. Retrieved 5 June 2012. ^ Subodh Kapoor (1 July 2002). The Indian Encyclopaedia. Cosmo Publications. pp. 565–. ISBN 978-81-7755-257-7. Retrieved 6 June 2012. ^ "Chhattisgarh delicacies". Chhattisgarh culture. journeymart.com. Retrieved 5 June 2012. ^ Kumar Suresh Singh (1994). People of India: Daman and Diu. Popular Prakashan. pp. 8–9. ISBN 978-81-7154-761-6. Retrieved 6 June 2012. ^ "Cuisines of Delhi, Famous Delhi Cuisine, Famous Delhi Food, Famous Food In Delhi". Indiasite. Archived from the original on 22 September 2013. Retrieved 9 December 2013. ^ "Indian Street Food in Delhi | A tour of authentic Indian street food in Delhi". Foodtourindelhi.com. Retrieved 9 December 2013. ^ a b Pat Chapman (3 March 2009). India: Food & Cooking: The Ultimate Book on Indian Cuisine. New Holland Publishers. pp. 38–. ISBN 978-1-84537-619-2. Retrieved 6 June 2012. ^ Amelia Thomas; Amy Karafin (1 October 2009). Goa and Mumbai. Lonely Planet. pp. 52–. ISBN 978-1-74104-894-0. Retrieved 6 June 2012. ^ "Goan cuisine". Goa dining guides. Archived from the original on 10 July 2012. Retrieved 5 June 2012. 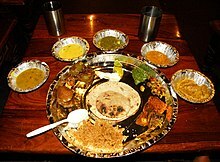 ^ "Gujurati Thali". Gujurati cuisine. indianfoodforever.com. Retrieved 5 June 2012. ^ "Gujurati cuisine". Gujurati recipes. khanapakana.com. Retrieved 5 June 2012. ^ Aruna Thaker; Arlene Barton (5 April 2012). Multicultural Handbook of Food, Nutrition and Dietetics. John Wiley & Sons. pp. 5–. ISBN 978-1-118-35046-1. Retrieved 27 June 2012. ^ Murdoch Books Pty Limited; Murdoch Books Test Kitchen (1 July 2010). India. Murdoch Books. pp. 9–. ISBN 978-1-74196-438-7. Retrieved 14 June 2012. ^ Priya Wickramasinghe; Carol Selva Rajah (1 February 2005). Food of India. Murdoch Books. pp. 13–. ISBN 978-1-74045-472-8. Retrieved 14 June 2012. ^ "Food of Haryana, Cuisine of Haryana, Famous Haryana Food, Recipes of Haryana, Haryana Food". Richindianculture.com. Retrieved 7 February 2011. ^ "Himachal Pradesh specialities". Himachal cuisine. mapsofindia.com. Archived from the original on 11 June 2012. Retrieved 5 June 2012. ^ "Kashmiri food". Kashmiri cuisine. food-india.com. Retrieved 5 June 2012. ^ "Kashmiri Wazwan". Metroplus. Chennai, India: thehindu.com. 11 April 2012. Retrieved 5 June 2012. ^ Anand, Karen (20 April 2012). "Treats from the Valley". The Times of India. ^ "10 Dishes of Cuisine of Jharkhand you must try at least once in Life". Great Indian Food. 30 September 2016. Archived from the original on 3 February 2017. Retrieved 1 November 2018. ^ "::Jharkhand Tourism::Cusines". www.jharkhandtourism.in. Retrieved 1 November 2018. ^ "High time to make most of mahua – Times of India". The Times of India. Retrieved 1 November 2018. ^ TNN (5 May 2009). "Kodagu still swears by pork". The Times of India. Retrieved 27 June 2012. ^ "Taste of Mangalore". The Hindu. Chennai, India. 17 June 2002. Archived from the original on 21 March 2012. Retrieved 27 June 2012. ^ Prabha Shastri Ranade (2009). Infrastructure Development and Its Environmental Impact: Study of Konkan Railway. Concept Publishing Company. pp. 162–. ISBN 978-81-8069-450-9. Retrieved 27 June 2012. ^ "Cuisine of Kerala". Retrieved 27 September 2016. ^ Zero Oil South Indian Cook Book. Dr. Bimal Chhajer. ISBN 978-81-288-0512-7. ^ India, [report prepared by] Planning Commission, Government of (2008). Kerala development report. New Delhi: Academic Foundation. ISBN 81-7188-594-2. ^ Bhandari Laveesh (2009). Indian States at a Glance 2008–09: Performance, Facts and Figures – Kerala. Pearson Education India. pp. 36–. ISBN 978-81-317-2340-1. Retrieved 26 June 2012. ^ "Deccan Chronicle". Retrieved 8 March 2015. ^ "Thalassery Biriyani". mysingaporekitchen.com. 16 November 2012. Archived from the original on 21 September 2013. Retrieved 4 July 2013. ^ Krishnakumar, PK (4 March 2008). "Cut in duty to boost packaged coconut water". The Economic Times. Retrieved 27 June 2012. ^ Gaur, Abhilash. "Outdoor Indore Abhilash Gaur on the legendary street-food delicacies of this businesslike city". Outlook traveller. Archived from the original on 31 January 2013. Retrieved 27 June 2012. ^ Esteves., Lesley A. (April 2008). "FOOD COURT Nawabi Bhopal is a long and large meal, discovers Lesley A. Esteves". Outlook traveller. Archived from the original on 31 January 2013. Retrieved 27 June 2012. ^ "India's bountiful breakfast options". The Times of India. 9 May 2010. Retrieved 27 June 2012. ^ "Indian Food and the West | New Emissary". The Diplomat. Retrieved 27 June 2012. ^ Marshall Cavendish Corporation (September 2007). World and Its People: Eastern and Southern Asia. Marshall Cavendish. pp. 415–. ISBN 978-0-7614-7631-3. Retrieved 28 June 2012. ^ "Flavours of Maharashtra at Renaissance". The Times of India. 12 July 2010. Retrieved 27 June 2012. ^ "Feed your 'Desi Mania' at Nirula's". Fnbnews. 10 May 2010. Retrieved 27 June 2012. ^ Lonely Planet blue list: the best in travel 2007. Lonely Planet. 31 October 2006. Retrieved 28 June 2012. ^ Hamlet Bareh (2001). Encyclopaedia of North-East India: Meghalaya. Mittal Publications. pp. 47–. ISBN 978-81-7099-791-7. Retrieved 28 June 2012. ^ "Mizo Cuisine in India". India9.com. 7 June 2005. Retrieved 7 February 2011. ^ "Food in Mizoram". Mapsofindia.com. 28 June 2013. Retrieved 9 December 2013. ^ Bhandari Laveesh (1 September 2009). Indian States at a Glance 2008–09: Performance, Facts And Figures – North-East And Sikkim. Pearson Education India. pp. 48–. ISBN 978-81-317-2348-7. Retrieved 31 May 2012. ^ Pran Nath Chopra (1992). Encyclopaedia of India: Nagaland. Rima Publishing House. p. 63. Retrieved 29 June 2012. ^ Susie J. Tharu; Ke Lalita (1 September 1993). Women Writing in India: The Twentieth century. Feminist Press. pp. 422–. ISBN 978-1-55861-029-3. Retrieved 28 June 2012. ^ Tarla Dalal (15 June 2007). Punjabi Khana. Sanjay & Co. p. 6. ISBN 978-81-89491-54-3. Retrieved 31 May 2012. ^ Colleen Taylor Sen (2004). Food Culture in India. Greenwood Publishing Group. pp. 94–. ISBN 978-0-313-32487-1. Retrieved 28 June 2012. ^ Tarla Dalal (15 June 2007). Punjabi Khana. Sanjay & Co. pp. 34–. ISBN 978-81-89491-54-3. Retrieved 28 June 2012. ^ Franklin Ng (1995). The Asian American Encyclopedia: Ho-Kor. Marshall Cavendish. ISBN 978-1-85435-680-2. Retrieved 28 June 2012. ^ "Punjabi cuisine.Khana-Indian Recipes and Cuisines". Archived from the original on 27 June 2012. ^ Clifford A. Wright (13 September 2005). Some Like It Hot: Spicy Favorites From The World's Hot Zones. Harvard Common Press. pp. 236–. ISBN 978-1-55832-269-1. Retrieved 29 June 2012. ^ Bhandari Laveesh (1 September 2009). Indian States at a Glance 2008–09: Performance, Facts And Figures – Rajasthan. Pearson Education India. pp. 38–. ISBN 978-81-317-2346-3. Retrieved 29 June 2012. ^ Timothy L. Gall; Jeneen Hobby (1 May 2009). Worldmark encyclopedia of cultures and daily life. Gale. ISBN 978-1-4144-4891-6. Retrieved 28 June 2012. ^ "Care for some Sindhi savouries?". Dnaindia.com. 5 November 2010. Retrieved 7 February 2011. ^ Lachu Moorjani; Marty Snortum (30 December 2005). Ajanta: Regional Feasts of India. Gibbs Smith. pp. 59–. ISBN 978-1-58685-777-6. Retrieved 3 June 2012. ^ Lisa Maree Heldke (14 February 2003). Exotic Appetites: Ruminations of a Food Adventurer. Routledge. pp. 34–. ISBN 978-0-415-94385-7. Retrieved 29 June 2012. ^ Joe Cummings (1 March 2000). Thailand. Lonely Planet. pp. 46–. ISBN 978-1-86450-026-4. Retrieved 29 June 2012. ^ Sanjeev Dak Kapoor. Shin Delights, 1/e 295.00. Popular Prakashan. pp. 8–. ISBN 978-81-7991-400-7. Retrieved 29 June 2012. ^ Eugene Fodor; William Curtis (1964). Fodor's guide to India. D. McKay. Retrieved 29 June 2012. ^ Dubey, Krishna gopal (2011). The Indian cuisine. PHI Learning. p. 233. ISBN 978-81-203-4170-8. Retrieved 28 June 2012. ^ Chapman, Pat (2009). India: food & cooking: The ultimate book on Indian cuisine. New Holland Publishers. pp. 38–39. ISBN 978-1-84537-619-2. Retrieved 7 July 2012. ^ a b Edelstein, Sari (2011). Food, Cuisine, and Cultural Competency for Culinary, Hospitality, and Nutrition Professionals. Jones & Bartlett Publishers. p. 276. ISBN 978-1-4496-1811-7. Retrieved 4 June 2012. ^ "Andhra Pradesh cuisine". Indianfoodforever.com. Retrieved 4 June 2012. ^ "Dum Pukht cooking". Compendium of food terms. theflavoursofhistory.com. Archived from the original on 2 April 2012. Retrieved 4 June 2012. ^ Satinder Kumar (2000). Encyclopaedia of South-Asian tribes. Anmol Publications. p. 3375. ISBN 978-81-261-0517-5. Retrieved 29 June 2012. ^ Krishna Prakash Bahadur; Sukhdev Singh Chib (1977). Caste, Tribes & Culture of India: North-Eastern India. Ess Ess Publications. p. 244. Retrieved 29 June 2012. ^ Krishna Gopal Dubey (2011). The Indian Cuisine. PHI Learning Pvt. Ltd. pp. 86–. ISBN 978-81-203-4170-8. Retrieved 28 June 2012. ^ Subodh Kapoor (1 July 2002). The Indian Encyclopaedia. Cosmo Publications. pp. 1748–. ISBN 978-81-7755-257-7. Retrieved 29 June 2012. ^ Abha Narain Lamba (1 September 2002). India. DK Pub. ISBN 978-0-7894-8395-9. Retrieved 29 June 2012. ^ a b Royal Mughal Ladies and Their Contributions. Retrieved 6 March 2015. ^ The Sunday Tribune – Spectrum – Lead Article. The Tribune. (13 July 2003). Retrieved 2012-08-06. ^ "Mughlai cuisine tops popularity charts in capital". Telegraph India. 5 July 2008. Retrieved 9 December 2013. ^ M. L. Dewan; Karan Singh; Piyoosh Rautela (1 January 2001). People's Movement for Himalayan Rejuvenation. Concept Publishing Company. pp. 93–. ISBN 978-81-7022-815-8. Retrieved 27 June 2012. ^ Majumdar, Boria (2013). Cooking on the run (1st ed.). Delhi: Harper Collins India. p. 192. ^ Bhandari Laveesh (2009). Indian States at a Glance 2008–09: Performance, Facts and Figures – West Bengal. Pearson Education India. pp. 30–. ISBN 978-81-317-2352-4. Retrieved 27 June 2012. ^ "Panel seal on rasgulla's Odisha origin - Committee cites references from old texts to refute Bengal's claim". The Telegraph. 13 July 2016. Archived from the original on 18 August 2017. Retrieved 2 November 2017. ^ "Rasgulla originated in Odisha, says researcher". The Times of India. 14 July 2016. Archived from the original on 14 August 2016. Retrieved 2 November 2017. ^ Mohanty, Asit (April 2017). "Rasagola:The Ritual Offering of Odisha" (PDF). Odisha Review: 76–94. ISSN 0970-8669. Archived from the original (PDF) on 2 November 2017. Retrieved 2 November 2017. ^ a b Anita Mannur (2004). Culinary Fictions: Food in South Asian Diasporic Culture. Temple University Press. p. 233. ISBN 978-1-4399-0078-9. Retrieved 21 July 2012. ^ a b Himadri Banerjee (2009). Calcutta Mosaic: Essays and Interviews on the Minority Communities of Calcutta. Anthem Press. p. 132. ISBN 978-81-905835-5-8. Retrieved 21 July 2012. ^ a b Deshpande, Shubada (25 October 1999). "Fare for the Desi Dragon". Rediff.com. Retrieved 21 July 2012. 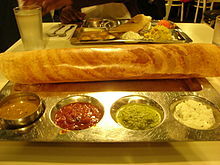 ^ "North Indian Food popularity in Singapore". ^ a b Davidson, Alan (2014). Tom Jaine (ed.). The Oxford Companion to Food (3rd ed.). Oxford: Oxford University Press. pp. 21–22. ISBN 0-19-967733-6. ^ "Sustainable shore – October recipe – Year of Food and Drink 2015 – National Library of Scotland". nls.uk. ^ Roy, Modhumita (7 August 2010). "Some Like It Hot: Class, Gender and Empire in the Making of Mulligatawny Soup". Economic and Political Weekly. 45 (32): 66–75. JSTOR 20764390. ^ "Cooking under the Raj". Retrieved 30 January 2008. ^ Alan Davidson (2014). Tom Jaine (ed.). The Oxford Companion to Food (3rd ed.). Oxford: Oxford University Press. pp. 410–411. ISBN 0-19-967733-6. ^ Preetha, M. Soundariya (30 March 2008). "As coffee gets popular". The Hindu. Chennai. ^ Anuja Balasubramanian; Hetal Jannu; Raj R. Patel, M.d. ; Raj R Patel M D (26 June 2011). The Healthy Indian Diet. Raj Patel. pp. 170–. ISBN 978-1-4611-2213-5. Retrieved 28 June 2012. ^ Lindsay Brown; Amelia Thomas (1 October 2008). Rajasthan, Delhi and Agra. Lonely Planet. p. 69. ISBN 978-1-74104-690-8. Retrieved 28 June 2012. ^ Sharon Tyler Herbst; Ron Herbst (3 August 2007). The New Food Lover's Companion. Barron's snippet. ISBN 978-0-7641-3577-4. Retrieved 28 June 2012. ^ Adak, Baishali (7 June 2012). "This sharbat is cool". Deccan Herald. Retrieved 28 June 2012. ^ Ravi Menon (21 June 2010). "German froth Bitburger to debut in India". Retrieved 28 June 2012. ^ Press Trust of India (21 September 2008). "Goan fenny, Assam tea, Lucknow chikan to get GI registry soon". The Economic Times. New Delhi, India. Retrieved 28 June 2012. ^ All-Asia guide. Far Eastern Economic Review. 1978. p. 162. ISBN 978-0-8048-1266-5. Retrieved 28 June 2012. ^ Charles W. Bamforth (29 September 2010). Beer Is Proof God Loves Us: Reaching for the Soul of Beer and Brewing. FT Press. p. 84. ISBN 978-0-13-706507-3. Retrieved 28 June 2012. ^ Tarla Dalal (26 February 2001). Achaar Aur Parathe. Sanjay & Co. pp. 85–. ISBN 978-81-86469-54-5. Retrieved 28 June 2012. ^ Pippa De Bruyn; Keith Bain; David Allardice; Shonar Joshi (12 February 2010). Frommer's India. John Wiley & Sons. pp. 38–. ISBN 978-0-470-60264-5. Retrieved 28 June 2012. ^ Pamela Goyan Kittler; Kathryn P. Sucher; Marcia Nelms (22 August 2011). Food and Culture. Cengage Learning. pp. 449–. ISBN 978-0-538-73497-4. Retrieved 28 June 2012. ^ "Cowed down by the ban". Hindustan Times. Archived from the original on 20 February 2012. ^ "Chapter 17, Verse 8,9,10". Bhagavad-Gita. Retrieved 9 December 2013. ^ Shah, Natubhai (1998). Jainism: The World of Conquerors. Sussex Academic Press. p. 249. ISBN 978-1-898723-30-1. Retrieved 29 June 2012. ^ Noel Pitts Gist; Roy Dean Wright (1973). Marginality and Identity: Anglo-Indians as a Racially-mixed Minority in India. Brill Archive. pp. 139–. ISBN 978-90-04-03638-3. Retrieved 28 June 2012. ^ Krishna Gopal Dubey (2011). The Indian Cuisine. PHI Learning Pvt. Ltd. pp. 232–. ISBN 978-81-203-4170-8. Retrieved 4 June 2012. ^ Collingham, Lizzie (1 February 2006). "Curry". The New York Times Book Review. Retrieved 5 May 2010. ^ "Tandoori Village Restaurant Brisbane". AsiaRooms.com. ^ Hilary Davidson (21 December 2009). Frommer's Toronto 2010. John Wiley & Sons. pp. 113–. ISBN 978-0-470-54126-5. Retrieved 28 June 2012. ^ Donald Olson (14 December 2009). Frommer's Vancouver and Victoria 2010. John Wiley & Sons. pp. 91–. ISBN 978-0-470-50735-3. Retrieved 28 June 2012. ^ Gordon Mathews (30 June 2011). Ghetto at the Center of the World: Chungking Mansions, Hong Kong. University of Chicago Press. pp. 34–. ISBN 978-0-226-51020-0. Retrieved 28 June 2012. ^ Civitello, Linda (29 March 2011). Cuisine and Culture: A History of Food and People. John Wiley & Sons. p. 267. ISBN 978-0-470-40371-6. Retrieved 4 June 2012. ^ "Indian food gains popularity during Chinese New Year". 20 February 2007. Archived from the original on 21 November 2008. ^ Then, Viviane. "Go India: Curry, my love?". ^ "About Food in Malaysia". Travellers Worldwide. Archived from the original on 21 June 2012. Retrieved 1 July 2012. ^ Ann Kondo Corum (1 May 2000). Ethnic Foods of Hawai'i. Bess Press. pp. 174–. ISBN 978-1-57306-117-9. Retrieved 4 June 2012. ^ "Robin Cook's chicken tikka masala speech". The Guardian. London. 19 April 2001. Retrieved 25 February 2002. ^ "Curry house founder is honoured". BBC Online. 29 September 2005. Retrieved 21 March 2012. ^ Food Standards Agency. "[ARCHIVED CONTENT] Food Standards Agency – Curry factfile". food.gov.uk. ^ "Food Standards Agency – Curry factfile". ^ "Robin Cook's chicken tikka masala speech". The Guardian. London. Retrieved 25 February 2002. ^ "Food:'Where's the Taj Mahal? ': Indian restaurants in Dublin since 1908". History Ireland. 5 March 2013. Retrieved 2 March 2017. ^ "'Non-Chinese Asians are the fastest growing ethnic group in Ireland – CSO'". 19 October 2012. ^ Bhide, Monica (24 January 2007). "Tikka in No Time". The Washington Post. Retrieved 4 June 2012.